In this photo taken Sunday, Sept. 4, 2011, a Philippine National Police officer stands next a giant saltwater crocodile which was captured by residents and crocodile farm staff along a creek in Bunawan township, Agusan Del Sur province in southern Philippines late Saturday. 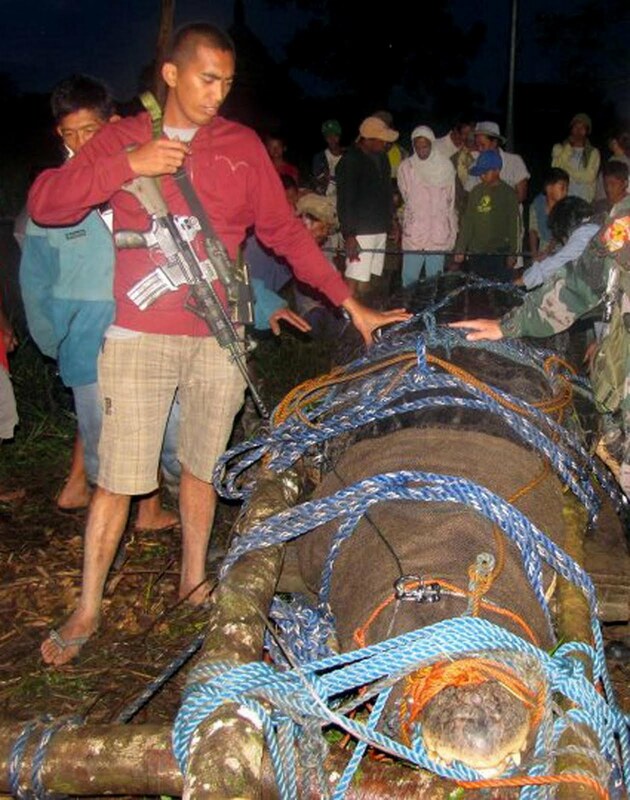 Mayor Cox Elorde of Bunawan said that dozens of villagers and experts ensnared the 21-foot (6.4-meter) male crocodile along a creek in his township after a three-week hunt. It was one of the largest crocodiles to be captured alive in the Philippines in recent years. Relieved Filipino villagers threw a fiesta when they captured a one-ton crocodile, with about 100 people pulling the feared beast from a creek by rope then hoisting it by crane onto a truck. The party may have been premature. 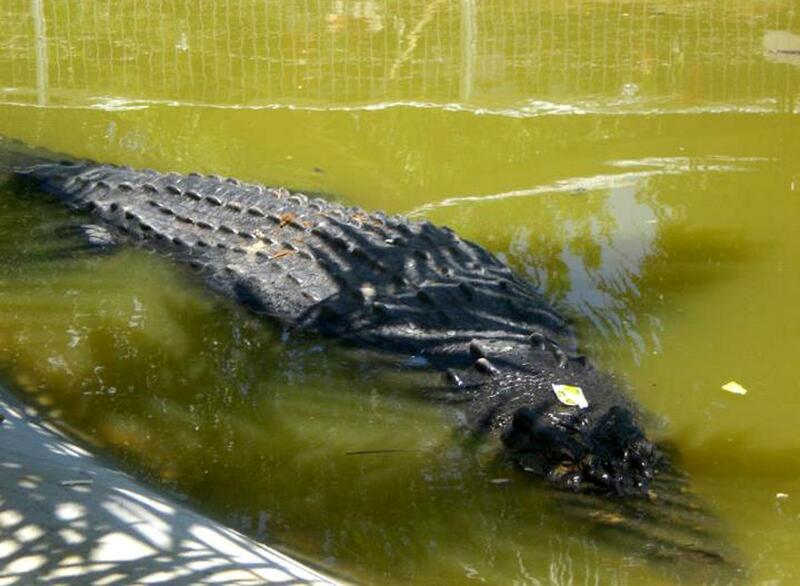 After the 20-foot (6.1-meter) saltwater crocodile was caught over the weekend, authorities said Tuesday an even bigger killer crocodile may lurk in creeks of the remote southern region. 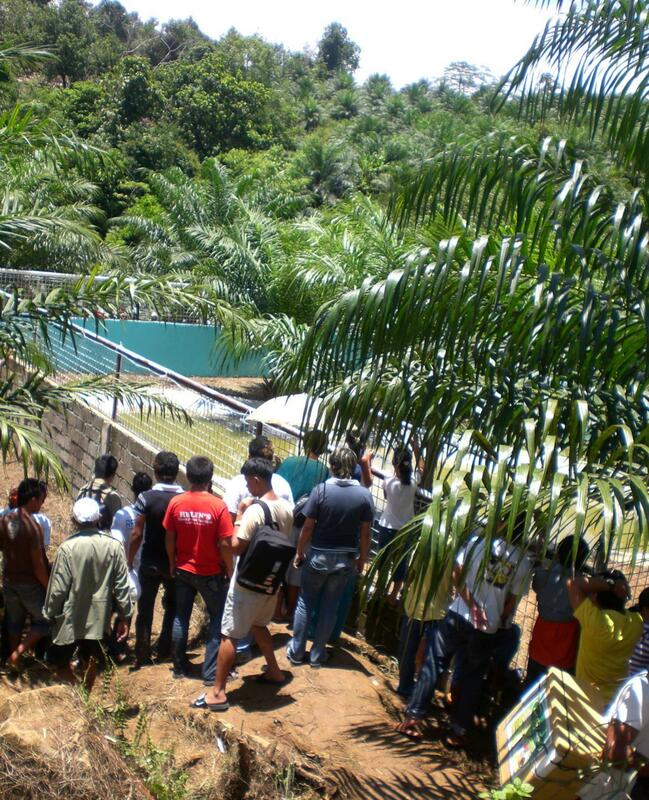 In this photo taken Sunday, Sept. 4, 2011, Mayor Cox Elorde of Bunawan township, Agusan del Sur Province, pretends to measure a huge crocodile which was captured by residents and crocodile farm staff along a creek in Bunawan late Saturday in southern Philippines. Elorde said Monday that dozens of villagers and experts ensnared the 21-foot (6.4-meter) male crocodile along a creek in his township after a three-week hunt. It was one of the largest crocodiles to be captured alive in the Philippines in recent years. The crocodile — weighing 2,370 pounds (1,075 kilograms) and estimated to be at least 50 years old — is the biggest caught alive in the Philippines in recent years. Wildlife officials were trying to confirm whether it was the largest such catch in the world, said Theresa Mundita Lim of the government's Protected Areas and Wildlife Bureau. It was captured alive after a three-week hunt in Bunawan township in Agusan del Sur province, where villagers have been terrified. A child was killed two years ago in the township by a crocodile that was not caught, and a croc is suspected of killing a fisherman missing since July. Villagers witnessed a crocodile killing a water buffalo last month. A saltwater crocodile swims in a shallow pond inside its temporary cage at the remote village of Consuelo, in Bunawan township, Agusan Del Sur province in southern Philippines, Tuesday, Sept. 6, 2011. The 6.1-meter (20-foot) saltwater crocodile, now named "Lolong," was captured last Saturday by villagers and veteran hunters in the creeks of the remote region. 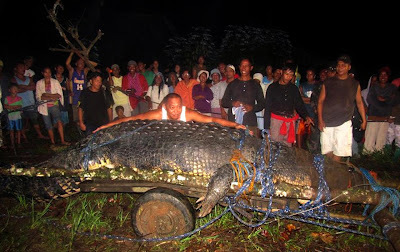 The crocodile, weighing 1,075 kilograms (2,370 pounds), was the biggest to be caught alive in the Philippines in recent years. Wildlife officials were trying to confirm whether it was the largest such catch in the world, said Theresa Mundita Lim of the government's Protected Areas and Wildlife Bureau. Bunawan villagers celebrated after they caught the crocodile. "It was like a feast, so many villagers turned up," Mayor Edwin Cox Elorde said. Wildlife official Ronnie Sumiller, who has hunted "nuisance crocodiles" for 20 years and led the team behind the capture in Bunawan, said a search was under way for a possibly larger crocodile he and villagers have seen roaming in the farming town's marshy outskirts. "There is a bigger one, and it could be the one creating problems," Sumiller told The Associated Press by telephone from Bunawan, about 515 miles (830 kilometers) southeast of Manila. "The villagers were saying 10 percent of their fear was gone because of the first capture," Sumiller said. "But there is still the other 90 percent to take care of." Backed by five village hunters he has trained, Sumiller has set 20 steel cable traps with an animal carcass as bait along the creek where the first crocodile was caught and in a nearby vast marshland. Sumiller said he found no human remains when he induced the captured crocodile to vomit. Residents from neighboring towns try to take a glimpse of a giant saltwater crocodile in its temporary cage at the remote village of Consuelo in Bunawan township, Agusan Del Sur province, southern Philippines, Tuesday, Sept. 6, 2011. The 6.1-meter (20-foot) saltwater crocodile, now named "Lolong," was captured last Saturday by villagers and veteran hunters in the creeks of the remote region. The crocodile, weighing 1,075 kilograms (2,370 pounds), was the biggest to be caught alive in the Philippines in recent years. Wildlife officials were trying to confirm whether it was the largest such catch in the world, said Theresa Mundita Lim of the government's Protected Areas and Wildlife Bureau. He said he was also summoned by Bunawan officials two years ago after a huge crocodile attacked and ate a child from a capsized boat in the marshland. The crocodile was not found at the time. People in the farming town of about 37,000 people have been told to avoid venturing into marshy areas alone at night, Elorde said. Guinness World Records lists a saltwater crocodile caught in Australia as the largest crocodile in captivity, measuring 17 feet 11.75 inches (5.48 meters). Saltwater crocodiles can live for more than 100 years and grow to 23 feet (7 meters). Elorde said he plans to make the captured crocodile "the biggest star" in an ecotourism park to be built to increase awareness of villagers and potential tourists of the vital role the dreaded reptiles play in the ecosystem. Philippine laws strictly prohibit civilians from killing endangered crocodiles, with violators facing up to 12 years in prison and a fine of 1 million pesos ($24,000). The world's most endangered freshwater variety, crocodylus mindorensis, is found only in the Philippines, where only about 250 are known to be in the wild. About 1,000 of the larger saltwater type, or crocodylus porosus, like the one captured in Bunawan, are scattered mostly in the country's southern swamplands, wildlife official Glen Rebong said. Environment Secretary Ramon Paje said the enormous crocodile was captured because it was a threat to the community but added the reptiles remind that the Philippines' remaining rich habitats need to be constantly protected. Crocodiles have been hunted in the country by poachers hoping to cash in on the high demand in wealthy Asian countries for their skin, which is coveted for vanity products ranging from bags to cellphone cases.